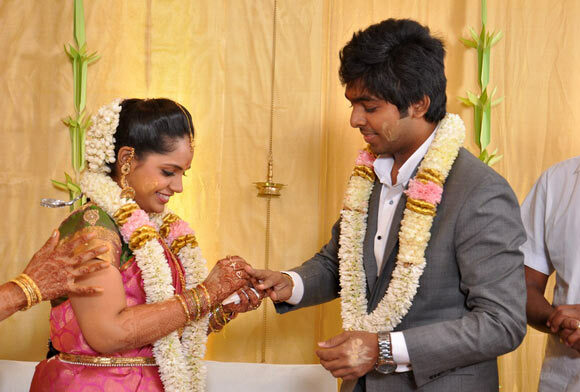 Music composer GV Prakash Kumar got engaged to Carnatic singer Saindhavi on June 26 at the Raintree Hotel in Chennai. G V Prakash is the son of A R Rahman's elder sister, A R Reihana, and has scored music in quite a few south movies. Besides carnatic singing, Saindhavi has also done playback singing in Tamil, Telugu and Kannada. Click Next to see more pictures of the engagement. Childhood sweethearts G V Prakash and Saindhavi studied together in Chettinad Vidyashram school. The engagement was attended by the couple's family and friends. 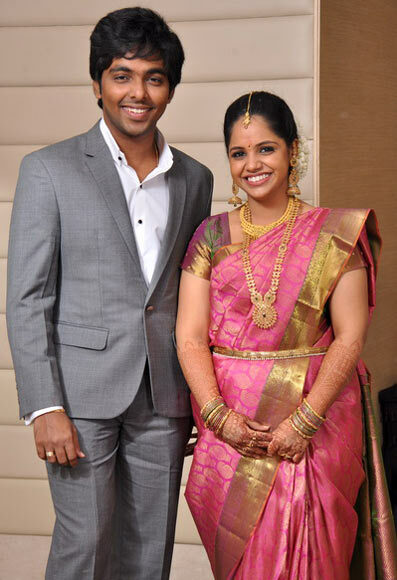 The wedding will take place on June 27 at the Mayor Ramanathan Chettiar Hall in Chennai.